Session 333. Stuart, Eric, James and I met at Aspendale at 7 a.m with some good wind blowing and squalls on the way. It had backed off a bit so I headed out on my Lithium 12, but I was overpowered when the stronger gusts came through so I swapped it for my 9 which was much nicer in the waves. I have just re-mounted the rear screw of my rear footstrap on the nugget after the screw was turn out when the board was towed recently. I visited OKE surfboards for advice - they said to plug the old hole with 5 minute araldite and use the next hole for the screw. I also wore by Ocean Rodeo drysuit with the bunny suit under it. It was nice when I got going but got quite hot and sweaty as the session progressed. Dunking into the water doesn't really cool you off in a drysuit and it wasn't really that cold. The waves were good and the wind quite punchy, it was just great to be on the water and in the air occasionally. No tricks today, just enjoying the wild weather. Session 332. Heavy rainfall and strong gusts swept through overnight and Sunday morning. I headed down to Mentone arriving at about 3pm. 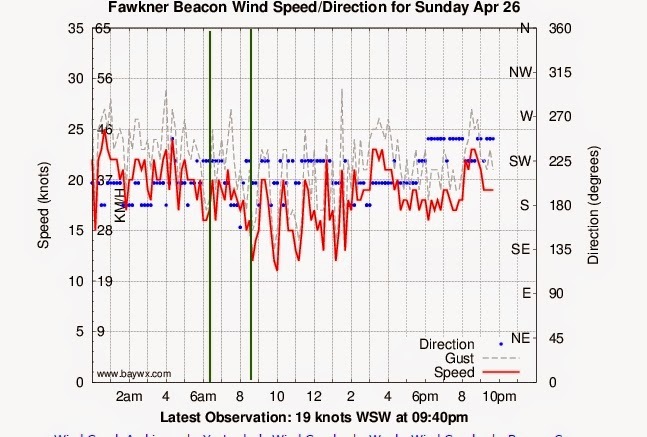 The wind had just backed off from around 30 knots to about 10! Several small kites (6 to 8m) were on the beach and kiters were packing up and leaving. Mr Styles showed up after a while and we pondered on whether more wind would come. I went back to the car to rest and wait. Mr Webb then showed up at about the time another squall was heading up the bay. 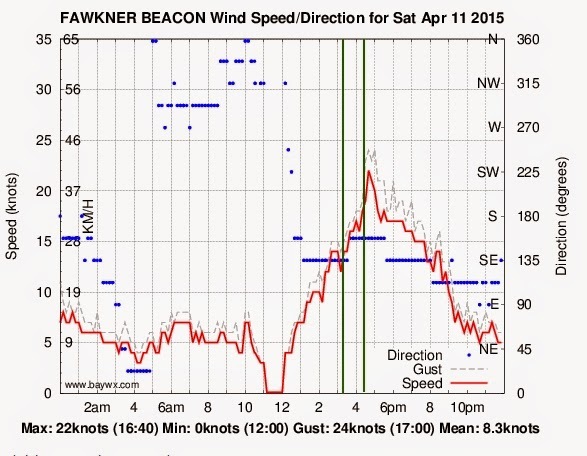 We decided to go out with smaller kites as the wind at South Channel was around 28 knots and likely to come through. We started well powered and had some runs enjoying the bay surf. 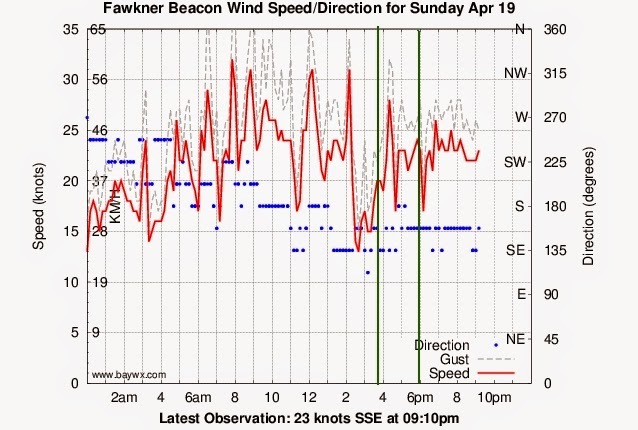 The wind dropped out then came back with a vengeance at over 25 knots with some east in it. I did a couple of massive jumps where my initial boost was doubled by a strong gust. Quite exhilarating and soft landings! The air temperature was around 10C and the water was cool so I appreciated my Ripcurl 4/3 wetsuit. Next time I will wear my booties too. We kited for about an hour until the wind backed off again. A really good but challenging session. Session 331. Back on the water the day after we returned from Europe, I missed kitesurfing! The wind was light, around 15 knots, so I took out the Flite 14.5. Once again it did not disappoint. I did several backrolls, most combined with a backloop, and landed a couple elegantly. Getting enough rotation is tricky and handling the pull of the loop is too. I was doing some downwind slalom turns as Stuart approached. On my last turn our kite nearly tangled so I dropped mine on the water. Unfortunately a bridle looped over a wing tip so I could not relaunch it. I released the safety to try and get it to untangle, but this only resulted in my lines getting tangled close to the bar. Another kiter flipped the snagged bridle over as I reset the bar, but the tangle meant I couldn't really fly the kite. 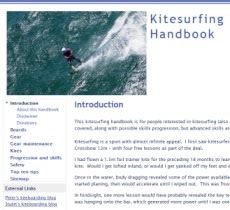 I eventually got it launched and was able to control it with only one line and body drag back to shore at Middle Brighton. Close to the shore I turned the kite around and attempted to land it but it kept flying. I released the safety and still it kept flying and pulling me horizontal to the shore, so I released it completely. I swam in and grabbed the kite as it blew into the shore. The other kiter towed by board in which was much appreaciated. I wasn't looking forward to searching for it. The new AT skis and boots are great. Some fresh snow at the top, firm icy sections in the middle and wet snow towards the bottom. The cloud descended as we waited for our ride. Once on the lift, a cheer from everyone packed into the lift went up when we burst through the cloud back into the sunshine! Jean, Stand and their group skied the normal route down. I ducked under the rope and headed for the direct route that other skiers were on. Great snow and a great view! I dropped over the headwall past a crevasse and got some great powder turns in, Veering left I even got some fresh snow. This is Chamonix skiing at its best. Then I descended in into the cloud with poor visibility. I teamed up with four Norwegians as we skied down then back onto the Bouchard piste run and below the cloud. I spent the rest of the day skiing with our Swiss friends who had arrived today and come up to Argentiere for a great afternoon skiing. Needless to say, they were all excellent skiers. Back in Chamonix we headed out to dinner at La Boccolatte and had a magnificent Raclette. I don't think I have ever eaten so much cheese!